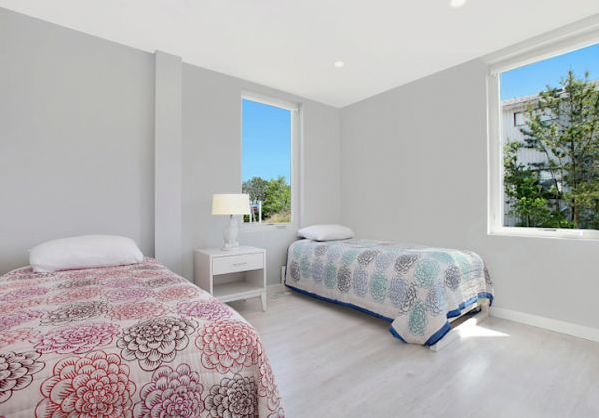 Long known as the summer beachfront playground for the rich and famous on America’s east coast, the Hamptons now sports a eco-friendly beach house you too can enjoy starting at around $6,500 USD for a one week stay. Measuring about 2,000 square feet inside, the stylish home, affectionately known as the ‘Beach Box’ is about 600 feet from the Atlantic and offers great views of the ocean, dunes and bay in New York’s affluent Long Island coastal community. 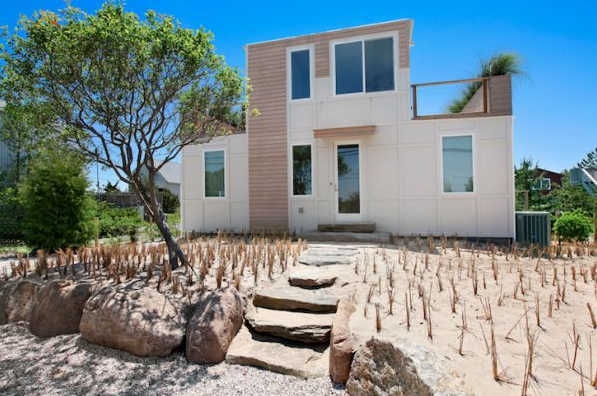 But what really sets this particular summer cottage apart from the other celebrity summer homes in the area is it was constructed from six repurposed shipping containers. From it’s core construction to its kitchen countertops, sustainability is the overriding theme of this beach home. Just about everything in the home is made out of renewable materials. But recycled doesn’t mean cheap. The home built in 2012 was at one time on the market for $1.4 million USD, but is now available for hire as a vacation home. 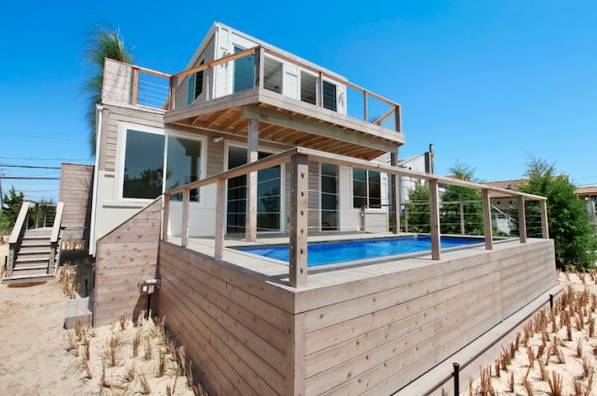 The 2-story Beach Box features lots of windows and glass sliding doors, a 1,300 square foot wrap-around deck, fireplace, white-washed oak flooring, a salt water swimming pool, and a elegant outdoor shower. Its floor plan includes 4 bedrooms and 2-1/2 baths, with many state of the art energy-saving appliances. The exterior is covered with sustainable cypress and panel siding. The eco-conscious design does give its occupants a hint at its container superstructure with an exposed ceiling design constructed out of corrugated fibreboard. The architects for this distinctive beach home say the entire home and exterior amenities took about 8 months to build. 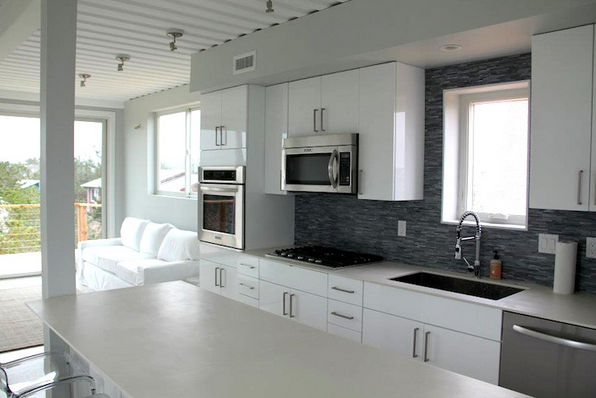 However, the main shipping container framework of the home was completely assembled in under 5 hours. We think beach retreats are a excellent use for recycled cargo containers. At the end of their shipping career, the boxes still have plenty of life left in them. 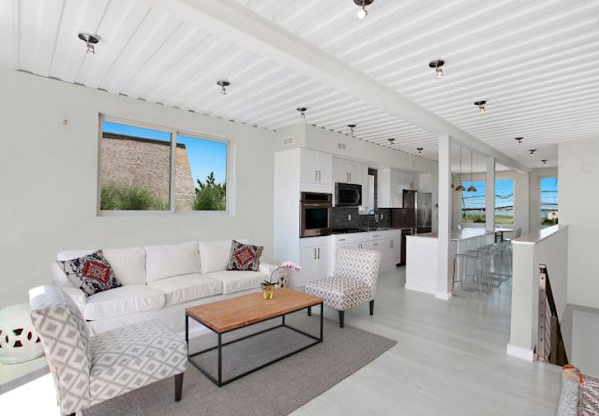 When installed properly, container homes are at least three times stronger than traditional stick buildings and can be dressed up to fit in almost anywhere – including posh neighborhoods like the Hamptons.